Canadian Cyclist's Editor headed over to the Track Worlds a day early so he could spend some time with Team SpiderTech p/b C10 at their north European base in Kortrijk, Belgium. 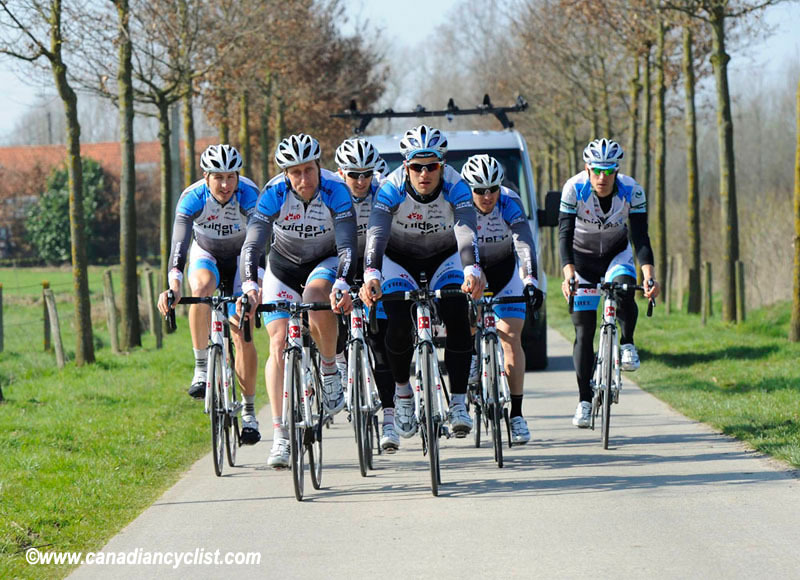 SpiderTech is Canada's only Pro Continental team. SpiderTech is about halfway through their three month spring campaign, which has taken riders to Sardinia, France and Belgium, and will finish at the end of April with the President's Tour of Turkey. The team has seen some strong results, including David Boily's Climbers Jersey at Sardinia, Keven Lacombe's eighth in Nokere and Svein Tuft's fourth place in the Prologue of the 3 Days of West Flanders. However, this is also a learning experience for many of the riders, who have never had this much concentrated racing in Europe. We spent the day with the team as they did a recon of the Dwars door Vlaanderen, to be run on Wednesday. It includes a number of the major climbs and cobble sections of the region. We then followed up with interviews with a number of the riders and team directeur Steve Bauer. A few shots below, but click on the Photo gallery for a lot more.